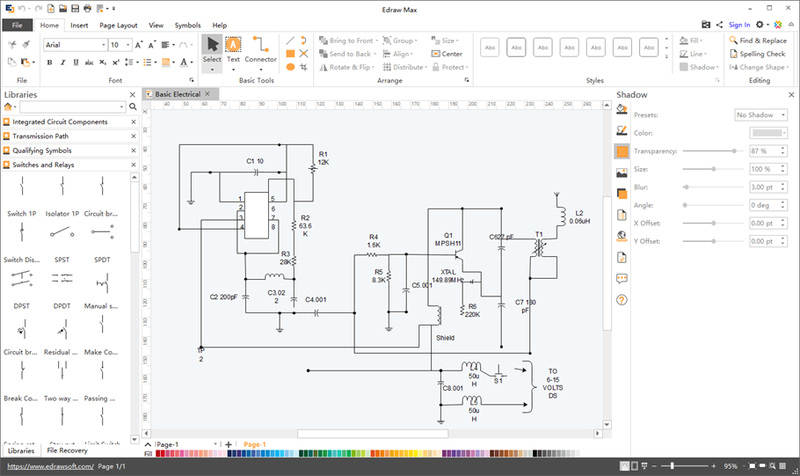 Schematics maker lets you create streamlined schematic diagrams, circuits, and wiring diagrams with a comprehensive list of electrical symbols. It\'s cloud-collaborative and compatible with Mac, Windows and Linux.Schematics maker focuses on providing the best service for drawing schematics and circuit diagrams. It\'s a fantastic program with powerful drawing capabilities and rich built-in symbols. No learning curve required, it allows users to build precise and good-looking electrical circuits with mouse clicks and export the documents as images, PDFs and other formats.More than 2000 of industry-standard electrical symbols are included in the program and categorized into different libraries. Choose a library title to get the symbols you need. They are vector symbols that can be stretched or modified without quality loss.